There’s a lot of mystery surrounding log lines. What are they? Do screenwriters really need them? Is there any correlation between log lines and actual logs in the forest? A little clunky. Not much of a “hook to stimulate interest” there either. At Script Quack Script Analysis, our definition of log lines bridges the gap between the two excerpted above. We like to think of the log line as a one sentence description of your story, outlining the key elements of hero, antagonist, conflict and irony. Our ideas about log lines were largely sculpted by Blake Snyder’s interpretation in “Save the Cat.” Snyder’s book focuses on crafting commercially viable screenplays. As such, he also suggests that your log line indicate audience and cost. But still, knowing all that doesn’t shine a very bright light on the process of crafting a good log line. It’s often an arduous, painstaking task, where the patient screenwriter must turn a pile of words over and over again, until they somehow resemble a smooth, seamless movie idea. And that’s why log lines are so essential. They force you to sculpt, trim and prune your idea into one that’s worth outlining, writing and re-writing a million times. Sometimes attempting to form a log line will teach you that your idea just doesn’t work. But when you’ve got a good idea, your log line will be the first nugget of gold that will guide you throughout the entire process. So without further delay, let’s mold a messy, nebulous idea into a strong log line that indicates hero, antagonist, conflict, irony, audience and cost. We’ll continue to use “The Bourne Identity” for this exercise. In the beginning, all you’ll really have is the bones of your idea, or story. The first step is to write all that down, as succinctly as you can. It’ll be very loose, and much too long at first, but don’t worry about that for now. When a highly-trained super spy wakes up with amnesia, on a boat in the middle of the sea, he begins the process of discovering his true identity. But the process is complicated, when he’s chased by stealthy assassins, and must risk his life. He runs from the assassins, darting across Europe with a beautiful female companion. In the end, he discovers that he is actually one of these assassins himself, but decides to run away, and give up killing forever. Now that that’s out of the way, you can start trimming. Read the clunky, awkward sentences above like an encrypted prison letter. There’s valuable stuff in there, if you can just find it. Scan for hero, antagonist, conflict and irony and cut everything else. That leaves “highly trained super spy,” “stealthy assassins,” “chased by…” and the irony is essentially Bourne’s amnesia. Don’t be afraid to leave out any details other than those specified above. All effective log lines omit story details. In the Bourne log line, for instance, we don’t need to mention Europe, the female companion, or the end of the story. Log lines are about brevity and subtlety. The power comes from how quickly and effectively you can communicate your idea. When a highly trained super spy with amnesia is hunted by stealthy assassins, he has to stay alive long enough to figure out who he is. Clearly, this isn’t eloquent writing. Right now, you’re just getting your ideas out. Block out your filter. Ignore that voice screaming that “THAT SENTENCE IS TERRIBLE AND CONFUSING!” Remain patient as you polish – the end result will be worth it. Time for another pass. This time, try to mold these elements with a little more grace. Cut unnecessary words, and make sure your details are accurate, informative and essential. The first thing I’d cut is “when.” This is a mistake that lots of first time writers make. “When” is an unnecessary word. If you cut it, you’ll throw your reader into the meat of your concept more quickly. The ‘when’ is implied. Next, look at how you’ve defined your hero. “Highly trained super spy.” That’s actually not too bad. But it’s a little redundant. Cut ‘super’ and the log line will work better. Continue to scour the log line for small redundancies. Play around with the order of the words. Make sure that all of the essential elements are clearly defined and prominent in the log line. A highly trained spy wakes up with amnesia and must determine his true identity before he’s killed by government assassins. Also take notice of the adjectives we’ve used. They were carefully selected to communicate as much as possible about the story in very few words. Finally, this log line clearly indicates audience and cost. Because it is a slim, trim story description, it’s clear that this is a standard ‘genre’ piece. It’s an action thriller. The demographic is clear. The cost can certainly vary, but could be ball-parked pretty accurately based on similar movies in the genre. Although this process isn’t the most glamorous part of screenwriting, it’s immensely satisfying. Log lines are hugely important to screenwriters. Yes – of course it’s possible to write without one, but we don’t advise it. Why deny yourself the joy of a tight, compact concept? As you form your outline and write your draft, you’ll find yourself referring back to the log line over and over again. It keeps you on track and will save you weeks – maybe months – of rewriting in the future. Script Quack is a top script analysis service. 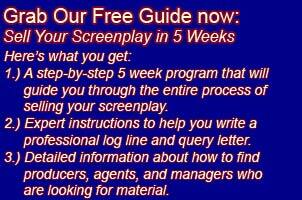 They offer screenplay consultations and script notes at affordable prices. All orders placed before May 18th receive free entry into the Script-a-thon, a screenplay contest coming up this July ($50 value). Script Quack offers log line analysis service, where your log line will receive the same treatment as displayed above. Just $4.99.